Darlings, in the left corner we have Giuseppe Zanotti’s extravagant E07031 Open Toe Bootie – the very same ones seen upon Tinsley Mortimer, Miley Cyrus, Whitney Port, Taylor Momsen, Cameron Diaz, and Mary-Kate Olsen; to the left feast your eyes upon the magnificent YESSIR by Promise. 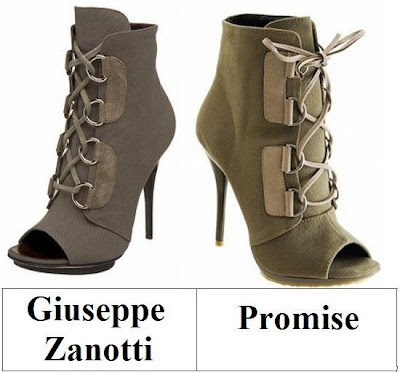 While the YESSIR pretty is more military green than military gray a la the glamorous Giuseppe’s; for just $39.98, in comparison to the $875.00 price tag of the Zanotti marvels, they are every bit as capable of adding a splash of military chic to one’s look du jour, at a price that no frugal fashionista will be able to refuse! Thanks to Endless and Love My Shoes for the pictures. Ooo this is a toughie!! I like the more expensive one so much better. Grr. I need a new job ASAP so i can get these!! I love high-topy boots like this!! I actually like Promise better, but I prefer the color of the Zanotti's. I think this is such a trendy look that splurging is unnecessary. I have to be a tightwad today and go for the Promise boots. J'adore. Hope you're having a good day. Yikes I could never walk in those heels, so if I had to pick, I'd go with the Promise. Stunning. I'd break my ankle. But stunning. I would def go with the less pricey version in this case!!!! $40? $40? That is amazing! I'd love to pair this with an oversized shirt and some skinny jeans. Love it! Oooooooh what a yummy affordable find, darling! Ooh, I like the color of the Zanotti version! LOVE those SHOES!! Def the less pricey ones....amazing! I love the promise ones! I haven't decided if I am brave enough to actually try this shoe style yet though! ooo, the promise ones are quite the find! i'd definitely be thrifty and go for them!! I like the Promise better...what is happening to me?? these are fierce. i likes them both! I love the budget ones better then the very expensive! The colour is more beautiful, I think. Oh tough one.... I think I like the cheaper one! I love these military boots...so gorgeous! I think I gotta go with the gray, though...I just like the color of that one that much better! i prefer the originals...they're a little bit cuter when it comes to the laces. but they're both gorgeous! I love the Giuseppe Zanotti ones so much. They're so beautiful! Wow they are almost the same. I can't believe the difference in price. whether it's military gray or green i think the yessir shoes by promise are awesome. they look just like the expensive ones but for only about $40. great find like usual! such a great price by Promise..someone is looking out for us spend thrifts. I like the Promise ones! The differences don't make the style too different and don't make them look cheap, which is perfect! So nice to see someone is putting out this shoe at an affordable price. Here is my assesment. The Giuseppe Zanottis are 2500% more expensive than the Promises. The Giuseppe Zanotti's are 10% cuter(because they are more refined and structured.) So in an ideal world in which I was loaded I would take the GZs anyday. However in reality land I would take the promises. I have to go with the Promise on this one, like the color better. Though I'm not that fond of peep toe booties. If it were in my budget, I'd go for the Giuseppe Zanotti. I just like the aesthetic a little better. Thats some boot/heel! Wow I dont think I could walk in those. But I bet they look hot on all the ladies that can! Love the cheaper ones...nicer style! of all the options you've showed in the past these are the most alike I've seen... amazing!!! Promises! The green color is different. I think I prefer the Zanottis in this case! Well, no matter if I spend $875 or $40 the heel will probably tumble me :/ all the same *sigh* but they are gorgeous so I think I'll go with the Zanotti's! The shoes are to-die-for... OMG! Ooh, I'm going with the big ticket item this time just because I am in luv with the color! Bargains are always great, that price is unbeatable. I'll take both!